LOS ANGELES — Spending 40 years sailing the world’s oceans has been a dream come true for John Jourdane, who retired from teaching and made a second career navigating the high seas. A boat delivery in 1975 turned into decades of travels and stories, ranging from Transpac competitions to sailing with the late Roy Disney, Sr., on Christopher Columbus’ navigational route from Spain to the Caribbean in 1992. 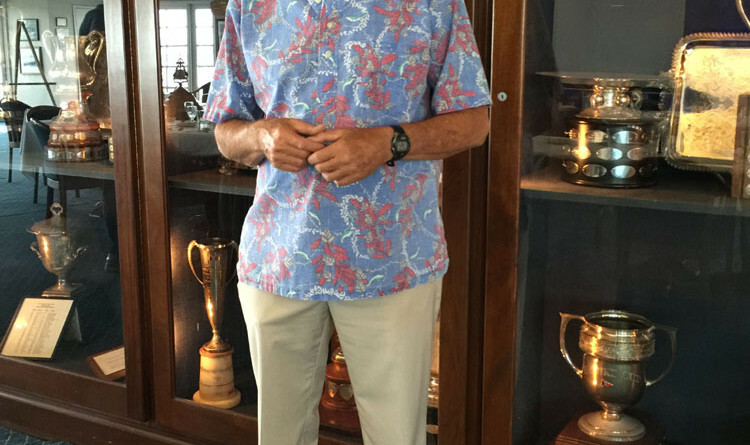 During his travels at sea, the Long Beach native found time to pen two books — “Icebergs, Port and Starboard” and “Sailing With Scoundrels and Kings” — and helmed the Reichel/Pugh 78 Zephyrus in this year’s Transpac Race and be named the world’s best racing navigator in 1993 by Yachting Magazine. Overall, Jourdane has sailed more than 300,000 miles, including 51 trips between California and Hawaii, 12 Atlantic Ocean sailings and three worldwide navigations. Chatting with Jourdane for a few minutes would likely mean hearing stories of sailing the South Pacific or viewing photos of his navigation around Cape Horn. There were also adventurous sails to New Zealand intertwined with teaching new sailors tricks of the trade through U.S. Sailing’s Safety at Sea Seminars. Jourdane, who recently recounted his storied career at a luncheon hosted by the Los Angeles Yacht Club, spent a few minutes with The Log to share his humble beginnings, the relationship he has with sailing and the direction he believes the sport is headed. The Log: How did you get into sailing? Jourdane: I learned to sail on Alamitos Bay in Naples Sabots when I was 12 or 13 years old. I sailed and surfed through high school and college at UCLA and USC. I joined the Peace Corps after college and taught biology in the University in Cali, Colombia, in Spanish. I returned to California and taught bi-lingual science (Spanish-English) in the San Jaoquin Valley. Was sailing something you always wanted to do? Sailing and surfing were a big part of my life starting in junior high school. How long were you in academia before sailing regularly? I taught science in Hawaii for 10 years before I “retired” and went sailing fulltime. What did you do for work once you sailed regularly? Sailing was an occupation. I was paid to race and deliver yachts in Hawaii, California and Florida. Where was (and is) “home” for you? You seem to accomplish more experiences in one sail than most do in entire lifetimes. How do you make each sail a reality? Sailing becomes your life. You live day to day, doing what you have to do to prepare the boat for a race or delivery. There’s a protocol you follow to make sure the boat is safe and fast, and the crew develop as a team. Just the same, is each sail different? How so? What remains constant from sail to sail? Every voyage is different. The boat is improved for speed and safety, the crew changes, and the wind and sea conditions are always different. Every trip is a new challenge and a learning experience. What memory remains with you? The voyages are all different, and the places I’ve seen are amazing, but I think the thing I treasure most is all the wonderful friends I’ve made worldwide. The Whitbread Round the World Races are probably the most memorable voyages. We sailed together as a team through gales, storms, wind, snow, icebergs and hot windless doldrums. It was like going to war. My crewmates are my brothers for life. How has sailing enriched your life? I fell in love with the ocean at a young age. I chose a life rich in experiences rather than rich in dollars. I’ve seen the world and have lived in many other countries. It was all made possible by sailing. How have you enriched sailing? I guess I am one of the more experienced offshore sailors in the world. I have tried to share my experiences with other sailors and people new to sailing. I am heavily involved in U.S. Sailing Safety at Sea Seminars, and helping new sailors to not make all the mistakes I’ve made over the years. I am also involved with several programs advocating cleaning up our oceans. What, if anything, do you have left to accomplish? I will keep sailing and sharing the joys of sailing with everyone I meet. Finally, what is your take on the state of sailing as an activity? Is it a sport that can grow? Where do you see the sport/activity headed in the next five to 10 years? Sailing is a great sport and activity. It is not losing followers, but increasing. There was a downturn after the economy problems after 2008, but it is on a rebound. I see more and more interest in sailing in the future.